Review: “Preserving with Friends” and that’s what I did. At the end of May, Calamity Jane gave away ten copies of Harriet Fasenfest’s DVD, Preserving with Friends. I shamelessly plugged myself and won one of the copies on the condition of giving it a thorough review. I was so excited to receive my DVD in June, and it was so generous (and trusting) of Harriet to give away ten copies! Then I had a baby in July, and Harriet and CJ probably thought I took the DVD and ran, but I didn’t. I watched it and took notes while I was breastfeeding. At first I was daunted by a three and a half hour DVD, but it is broken up into lots of short, easy to digest segments, which worked perfectly for me. I was able to watch one or two sections during the kids’ nap times. It also includes some cool bonus features if you stick it in your computer (printable charts, pectin making instructions, etc.). 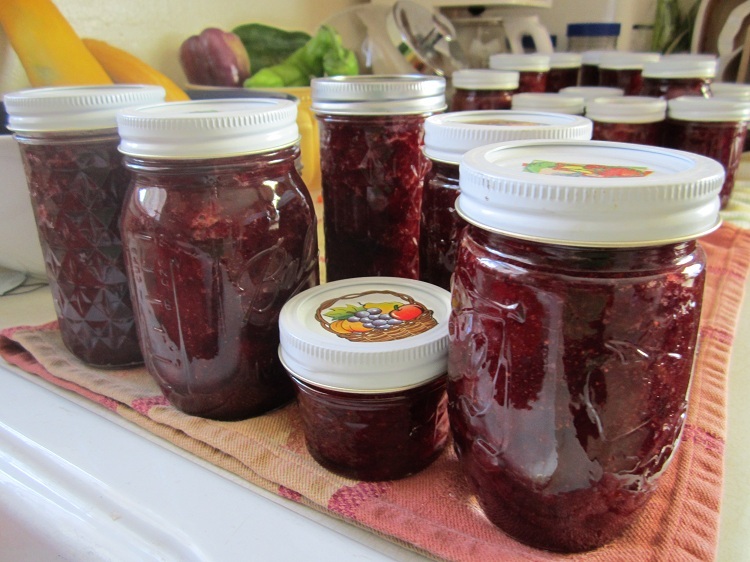 I have made jam and pickles before, so I was tempted to skip over the beginning where Harriet talked about boiling water bath canning basics, but I am glad I didn’t. The DVD offers a lot of great tips, and my favorite was boiling your jam in a low, wide pan so that the liquid evaporates more quickly, and that she was working outside on her grill! Two of the most daunting parts of jam making (the time it takes and how hot it gets in my non-air conditioned house) solved, right off the bat! I wish I had this DVD when I was learning how to make jam. Actually seeing how Harriet does it made it so much easier to understand. Much less intimidating! When I got to the canning fruit section, I found myself saying that I could can tomatoes! I always wanted to but was too intimidated! The gems offered in this DVD continue throughout with Harriet’s guests, showing different techniques for making pickles, fermenting and something I was most curious about, pressure canning. She has the experts in each of these fields sharing their recipes and tips. Actually seeing the methods helped me so much more than just reading about them in a book. The DVD includes a bonus section featuring the basics of dehydrating with an electric food dehydrator, freezing with a vacuum sealer and storing root vegetables like onions and garlic. I wish there was more on these techniques, but they could probably be a whole DVD unto themselves! Then this weekend, after picking some fresh berries, I had a friend over and we put Harriet’s techniques to the test. 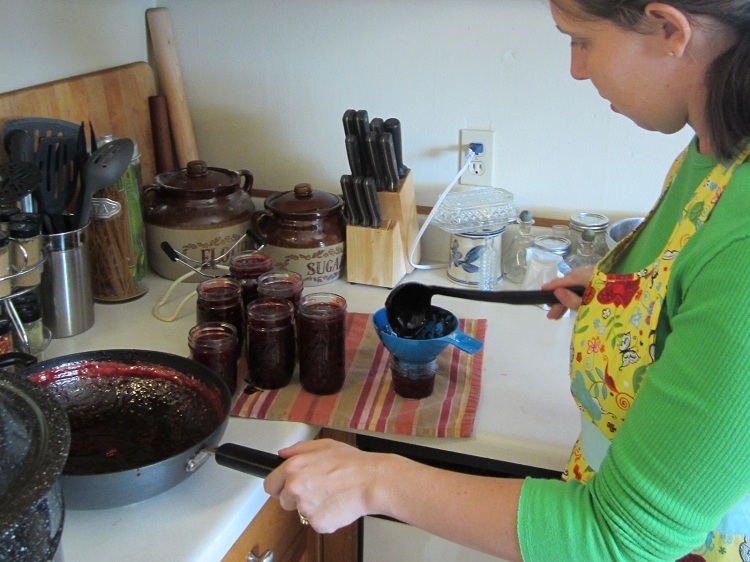 I know I promised to do the plums, but since they are frozen and we had fresh berries that we didn’t want to go to waste, we tried Harriet’s recipe for strawberry jam. Using a wide pan really saved time and I was really happy with the turn out. And my friend who had never done any canning or preserving before was happy to try it and she even borrowed my DVD. I was tempted to give it away too, but I actually plan to re-watch some sections after I get a big jar for fermenting and a pressure canner of my own. Also, as a side note, I love the name of the DVD. 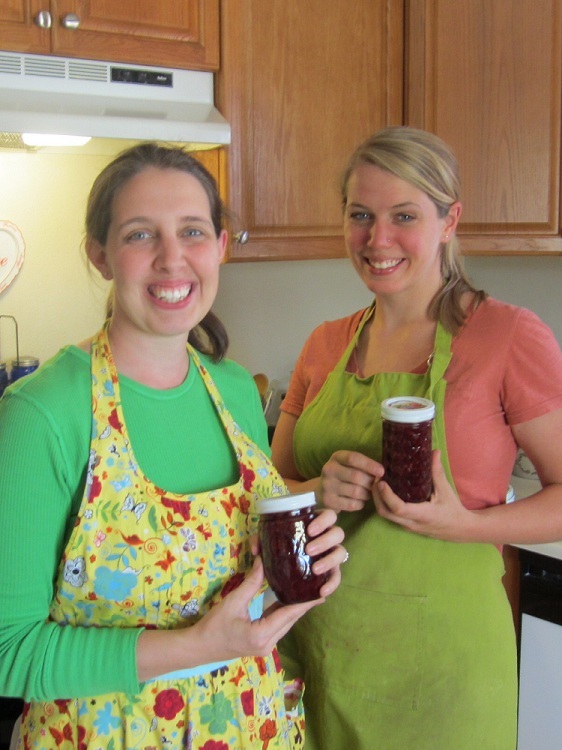 It is much more fun to preserve food with a friend. Much more fun. So thanks too, to Kristen for coming over and jamming with me! Usually I don’t promote products on my blog, but I have to say that I really liked seeing these techniques, and since so many of us are teaching ourselves these arts, the Preserving with Friends DVD is a great alternative to a book. It is excellent for visual learners or for giving yourself that confidence boost to stop thinking about it and actually getting yourself some jam in the cupboard. It’s totally worth the $24.95 to purchase it. So, get yourself Harriet’s DVD, grab a friend and stock that pantry! Look at you! I am amazed at what you can do and with just having a baby. I also think it is wonderful how you utilize your space to the fullest. You put me to shame. Enjoy reading your posts. thanks for the thorough review! i will tip Harriet off. i especially like the name too, not only is it more fun, but i think that for most people, finding real live community is what makes this lifestyle sustainable. doing and making stuff with other folks cements some wonderful bonds. I agree about community! So happy I found a friend close by to jam with! And, CJ – Thank YOU for hosting the give away and rewarding my shameless pleading!